It is widely believed by Thais, that Emperor Ashoka sent Buddhist missionaries to Thailand in the 3rd century B.C. While this is quite possible, there is at present no evidence to support this belief. In the main, however, it came with Indian traders and settlers who for seven hundred years, frequented the shores of Burma, Malaya, Indonesia, Thailand and Cambodia. The early settlers brought both Hinduism and Buddhism, as evidenced by numerous images of Vishnu, Shiva and Buddha found in early sites in Thailand. Animism antedated both Hinduism and Buddhism in Thailand and has persisted to the present day, chiefly in the form of spirit shrines in doors, yards and business premises. By the 6th century A.D. Buddhism was well established in south and central areas of what is now Thailand. Later Mahayana and Tantra together with Hinduism became the predominant religions. Phra Pathom Chedi in Nakhon Pathom, Thailand. 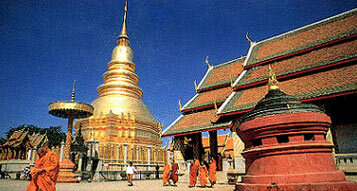 King Mongkut (Rama IV) surmised that it probably was the first stupa to be built in Thailand. King Asoka distributed Buddha's relics among various Buddhist countries including Suwannaphumi. Nakhon Pathom was possibly the capital of Suwannaphumi (approx. 139 B.C -457 A.D.) King Asoka sent to two missionaries, Sona Dhera and Uttara Dhera to Suwannaphumi as recorded in the Mahavamsa. The Mons of southern Burma adopted Theravada Buddhism at an early date and thereafter influenced the religious history of Thailand by invading the central valley of the Menam Chao Phya and setting up the Kingdom of Dvaravati which lasted from the third to the seventh centuries. They left numerous stupas and a distinctive style of Buddhist image. Theravada Buddhism in Thailand was further strengthened after King Anawrahta of Burma captured Thanton in 1057 A.D. From there he carried to his capital at Pagan a number of Theravadin monks together with the Pali canon, and being an ardent Theravadin he spread his religion along with his conquests in northern Thailand. Later as the Thai moved south from Yuman in the twelfth and thirteenth centuries they came in contact with this form of Buddhism. When they set up the Thai Kingdom of Sukhothai, about 1238 A.D. it was with Theravada Buddhism as the state religion. The history of Thailand begins with the rise of the Sukhothai Kingdom in the thirteenth century, a State whose people were one in blood and language with the present Thais. Under devout kings of Ayudhya, Buddhism flourished, and by 1750 must have accumulated great quantities of sacred writings and valuable chronicles connected with the Monastic Order. Practically all such writings were destroyed in the devastation that attended the Burmese invasion of 1766-1767. Ayudhaya, the capital, fell after a siege of fourteen months during which fires and epidemics ravaged the city. However, by the 13th and 14th centuries monks from Sri Lanka succeeded in establishing Theravada Buddhism and it has remained the state religion ever since. The first two kings of the present Chakri dynasty, who reigned from 1782 to 1824, are known by the names of Phra Buddha Yod Fa and Phra Buddha Loet la. While the third king, Phra Nang Klao, did not possess the name "Buddha" he was known for his devotion to the Order and his aid in temple building and scriptural revision. The son of King Mongkut, the fourth ruler, Prince Vajirayanvaroros was virtually head of the Buddhist Monastic Order from 1892 to 1910; until his death in 1921 he was Prince Patriarch. Thereafter a grandson of Rama 111 became Prince Patriarch and filled this high position until his death in 1937. It has been the custom of all the Thai kings to serve a novitiate in the temple of their youth, thus the Throne has been closely bound to the Buddhist Order by ties of experience as well as by personal interest. Never having been conquered by the colonial powers, Thailand was never subjected to assaults by Christian missionaries or imposed Western influence, and today some 94% of Thais call themselves Buddhists. In the 19th century King Mongkut, himself a former monk, conducted a campaign to reform and modernise the monkhood, a movement that has continued in the present century under the inspiration of several great ascetic monks from the northeast of the country. The Western disciples of one of these monks, Ajhan Cha, have successfully founded thriving monasteries in the United Kingdom, Australia, New Zealand and several other countries.